Those with a ** next to their name gave an additional donation. Those with *** have given a $25 or greater donation. Thanks to all those who have joined or renewed their commitment, and those who have given additional donations to support our many causes. Get on board now for all the benefits, including discounts at all the bike shops. The next regular HBBCA meeting will be held at 6:00 p.m., Monday, November 16th, at Carmela’s Mexican Restaurant, 13th and G Streets in Arcata. Dinner is optional. Agenda items may be suggested by emailing: info@humbike.org. At this meeting, we will discuss the fact that attendance at recent meetings has been very low, generally the same 4-5 at each meeting. Are there ways to increase interest? Each year, the HBBCA provides its members with a Bicycling Calendar so that daily bicycling miles can be recorded. As you may have heard, Rick Knapp kept track of his miles on a calendar just like this every year since 1974 when he became a bike commuter. It is with this rudimentary tool that he was able to determine that he had achieved 100,000 bike miles on July 4, 2015. You can do it, too, maybe better. But, if you don’t keep track you will never know what you have accomplished. 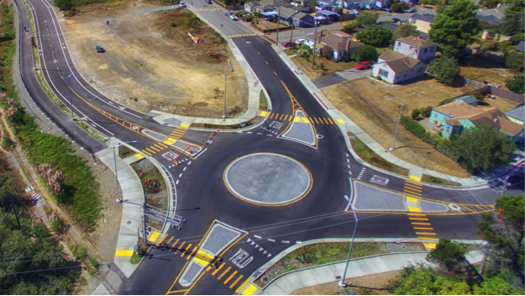 In case you haven’t experienced yet first hand, below is a nice aerial view of the new Foster Avenue Extension which was officially welcomed into existence by the City during a September 14, 2015 ribbon cutting. "The County of Humboldt and Caltrans have received $1.7 million to build a separated bike and pedestrian shared-use path alongside Route 255 in Manila. The path will run along the west side of the highway from Dean Street to Carlson Drive, providing a safe linkage between the Manila Community Center, Redwood Coast Montessori School, Willow and Dunes Daycare, public transit and school bus stops, and the Humboldt Coastal Nature Center. The funding will also provide for a public education campaign to encourage bike and pedestrian safety. The project is anticipated to be completed in October of 2018." Most of you know Rick Knapp as the President of HBBCA, but I know him as Captain Rick and probably spend more time looking at his backside than most of you. Some years ago I gave up my old mountain bike and the antique Schwinn Continental that had been passed around in our family as my vision had deteriorated to the point that I no longer felt safe riding independently. A few years ago my interest in cycling was renewed when a used purple Santana tandem, dressed up with hot pink accessories, entered my life. This spring Rick enthusiastically took on his new alter ego as Captain Rick after a chance meeting at a local bike shop. There are a few tricks and techniques to learning how to ride a tandem as well as a lot of teamwork. If you are not familiar with tandem talk, the person riding in front is known as the Pilot or the Captain and the person in back is called the Stoker. Although Rick is a super cyclist, he had to learn the Primary Rule of Tandeming, “The stoker makes no mistakes.” Captain Rick has creatively added a few new words of his own to the tandem lexicon such as “Quack-Quack”, which means that I should duck so he can use his helmet mirror to look at something behind and to the right (like a freeway on-ramp). While I cannot claim to be a true bicycle commuter, time on the tandem means the click, click of changing gears and feeling for my water bottle. Time on the tandem means smelling the eucalyptus trees near College of the Redwoods and hearing the geese in the fields off Highway 255. Next time you are on your bike think about the myriad of sights, sounds and smells you just can’t experience the same way from the inside of a car! At long last the City of Eureka has its own stencil of a helmeted bike rider with lane arrow so that they can refresh disappearing bike lane markings. At the suggestion of the HBBCA, they have begun redoing those on Henderson and on Wabash, some of the most invisible in the City. Hopefully, over time, others will be done. Previously, they were only done when stripping contractors were contracted to do them. Usually, stripping was redone, but bike lane symbols were not. If you see other areas you think should be done, phone or email the City contact listed in this newsletter. Bike Party Humboldt Hosting Bike Party on Friday the 13th! Thank you so much for your willingness to pitch in where needed in order to make the Latino Bike Rodeo such a success. It’s fun to work together to nurture the next generation of HBBCA members. The HBBCA checked with agencies in the Humboldt Bay region to determine appropriate contact personnel to respond to bike-related issues. If you see a condition that needs to be corrected in order to improve safety or convenience for cyclists such as a pothole in a bike lane, accumulated debris on a roadway shoulder, the need to re-stripe a bike lane, the need to clear vegetation encroaching on a shoulder, or a street light that is out, call the responsible agency/person listed below. The HBBCA is working to improve and encourage bicycle commuting. Help make it happen by joining now or renewing your membership for 2016. Your $5.00 annual dues, paid on a calendar year basis, will help pay for youth helmets, bike racks, this newsletter, the website, BikeSmart promotions, “Bike Month” activities, prizes, postage, etc. And, it will help demonstrate your commitment to our goal. With your membership card, you may request the following discounts on bike parts and accessories: 10% (or more) at Henderson Center Bicycles; 10% at Revolution Bicycle Repair; 15% at Adventure’s Edge; 10% at Pacific Outfitters, and 15% at Sport and Cycle. Membership cards include stickers on the back showing discounts offered by the various bike shops.